A searing representation of the current American zeitgeist, CITIZEN: AN AMERICAN LYRIC [by Claudia Rankine] is a boundary-bending work of poetry/prose/criticism, adapted for the stage by Stephen Sachs. A 6-member "ensemble piece... floats between dream and reality, narration and performance, and challenges its audience's perceptions," as it examines the ways racism pervades daily life in America, from highly visible news accounts to the daily microaggressions that render certain citizens invisible in our culture. That's a pretty apt description for this piece that is more than theater, it's a lesson for how to be in this world. But it doesn't feel like a lesson, it doesn't feel preachy, rather it lays bare the flaws in our society in the way that we deal with race, historically and currently. Only four more performances remain this weekend, and if you're interested in a powerful, disturbing, and transfixing piece of theater that goes beyond mere performance, I recommend that you reserve your tickets now (the show I attended was sold out). Under the direction of Wendy Knox, six actors (Heather Bunch, Hope Cervantes, Michael Hanna, Theo Langason, Joe Nathan Thomas, and Dana Lee Thompson) bring this book to life. I have a hard time being engaged while reading poetry, but when spoken by this wonderful cast, it's spellbinding. The subtitle "An American Lyric" is appropriate; the language feels lyrical and poetic, while still being harsh and brutal. From tiny short scenes to more lengthy sequences, instances of racism are examined, from not wanting to sit next to someone on the subway, to unfair umpire calls against tennis star Serena Williams, to Hurricane Katrina. The play is beautifully constructed and directed so that one scene flows into the next, greatly aided by the projection of images and videos (designed by Bill Cottman). 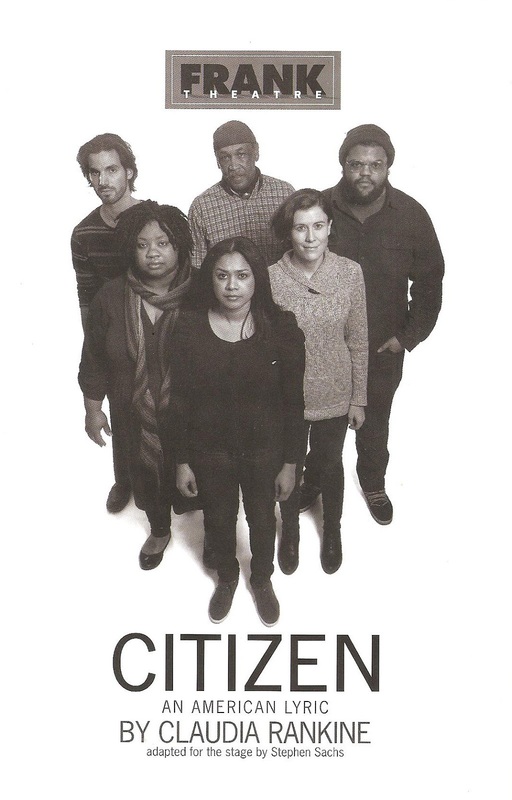 Frank's production of Citizen: An American Lyric will make you rethink the words that you say, and the words that you hear around you. And that's exactly what we need - to truly see the instances and effects of racism large and small, so that we can begin to do better. Read more reviews from my fellow Twin Cities Theater Bloggers here.